Please note that the content of this book primarily consists of articles available from Wikipedia or other free sources online. 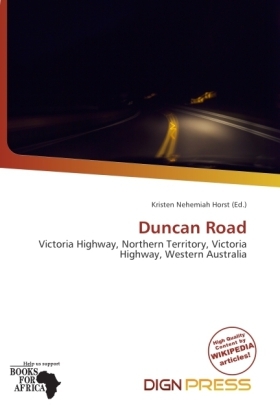 Duncan Road is a generally northeast-southwest former highway in the northeast of Western Australia and northwest of Northern Territory which links the Victoria Highway with Halls Creek. The highway is approximately 443 kilometres (275 mi) in length, is confusingly designated as National Route 80 from Nicholson to Halls Creek and snakes its way through the Western Australia / Northern Territory borders numerous times from Victoria Highway to Buntine Highway in a north-south direction.